Fantasy/YA | Caught in a book! I thoroughly enjoyed this book. I love Cas with his determination to get to the bottom of things and his insecurity about his own worth without his athame and the secret warmth he feels at having made friends when he never allowed himself to make any before and most of all for his protectiveness towards Anna. I love his charm brewing, patient mother, I love trips-over-his-own-foot Thomas and I love curious and meddling Carmel. I even liked the mean boys from school because they were so well placed. The parents weren’t MIA in this book even though it’s about a seventeen year old boy who goes all around the world killing ghosts. 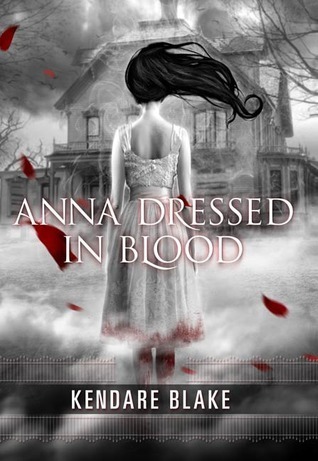 There were places towards the end of the book where I felt like I was the only one aware that Anna was a ghost and not another human being, whereas the rest of the ‘circle’ was oddly blasé about it. That’s possibly something that was peculiar to their situation. They had bigger, badder things to worry about than one bloody ghost. I had read in some reviews that the book is creepy. It didn’t read creepy to me. There was plenty of gore, but if you read a lot of urban fantasy novels or crime fiction I suppose you get inured to it. The book wasn’t scary. It was…fast-paced, interesting, gripping, (sweet) and what seemed to be the perfect series starter. I can’t wait for book two!! #8 A Match Made in Heaven (graphic novel): A review! Girl is a teenage graphic novel artist. Girl is an outcast in a posh school. Girl has a best friend. Girl meets angel pretending to be human. Girl’s best friend seems of particular interest to angel. Girl meets less angelic new girl, cousin to angel hero. Girl has a very bad day, mean new girl watches in glee. Girl needs rescue, angel provides. Girl figures out the truth. Girl’s best friend comes to her when things go wrong for her family. Girl turns to angel, but angel tells girl she can help more than he can. Girl accepts this and does something brave. Girl’s angel boyfriend gets a call from powers that be to come back home due to his mucking up. Girl sad and resigned but with new material for another graphic novel…about an angel. Disclaimer: Netgalley Arc. Short, honest review in exchange for cool free graphic novel. For weeks I’ve been suppressing my urge to turn this review into a long rant on The Fallibility of Even the Most Dependable Reviewers (also known as The Hypocrisy* of Previously Venerated Reviewers) in an effort to give other readers a relatively unbiased opinion on a book I happened to pick up on the enthusiastic recommendation of someone, by an author I’d not heard of before. But be warned, while the review will stay clear of criticising well meaning but very much mistaken reviewers, this is not me at my most objective. Yep, look at it. You can just TELL that this a book that subverts all YA tropes. Katy moved to a small town without knowing quite why her mom was so insistent about it. But her mother seemed happier to have moved, certainly more herself than she had been since Katy’s dad died, so Katy went along with it. Then she discovered that the two unbelievably good looking siblings living next door, with the mysteriously-absent-parents disease, happened to be aliens. It all became quite clear (and not so very important) after Daemon, who was alternately glaring and smouldering at her, saved her life a few times. Which frankly is true. They did. But then they had super powers like shape shifting, super speed, invisibility and instant healing.Of course they thought they’re better than the people whose government penned them in small communities and monitored their every movement. Also, Katy dear, these people had lost their planet. Their entire civilization had been wiped off. Consider that for a moment. Not that the author dwells on such sad, momentous things much. See our hero, his twin sister and their group came from the planet of light and are thus called Luxen and they have an enemy, the Arum who are evil people only intent on stealing their powers and creating havoc. This particular part of the novel bugged me a lot. No war on earth has ever been fought unprovoked though most have been sustained by greed. The idea that the Arum were EVIL (and had powers akin to darkness) while the Luxen were GOOD (and all golden and lit up in their true forms) is just…so…simplistic. Frankly I’m hoping this is the part that the author decides to subvert in the next novel. Please! Anyway, so even without planets they’re fighting interplanetary wars. The Arums are hunting Luxen and for some reason the Luxen are letting the human government agencies, who’re giving them jobs and houses, mistake the Arum for Luxen and help them too. Also these seem to be very non-curious government agencies. And mind you, we are AGAIN talking solely of the US govt agencies, because no other country can have aliens land in them. In nearly twenty years, they don’t seem to have figured out how powerful these immigrant aliens are. Another thing is the slight to science fiction. I’m a Star Trek girl. Voyager was my favourite series, right after the Original series. To have the alien protagonist brush off the science of bending time and space because ‘he wasn’t a scientist’ made me grit my teeth. Now it makes sense if a human says that about astrophysics. But just like it’s snort-worthy if a human teenager says I’m not a scientist so I can’t explain how my feet carry me across the street or why I poop after I eat, it’s ridiculous that a being made of light can’t explain how his own super speed skills work! Shouldn’t they have had this class when he was a little kid? From one of the immigrant adults maybe, since the parents never made it? And these aliens are supposed to be super intelligent too. Also, how DOES that work? How can light exceed its own speed? How can travelling millions of light years be done in months, maybe weeks by a ‘body of light’? But back to the story! I didn’t really think the entire thing was ridiculous. 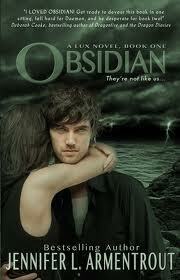 I enjoyed Katy and Daemon and their predictable struggle against mutual attraction through the novel. I liked Katy for knowing exactly what a big jerk Daemon was being but lusting after him anyway. I enjoyed this book just the way I enjoyed Twilight. With deep appreciation for an unrealistic, escapist, every-teenage-girl-dreams-of-this situation. But while I liked Twilight for revelling in its own dreamland quality, this seventeenth retelling of the tale doesn’t even get points for originality. Some readers have seen this as the author’s sense of humour. They have chosen to believe that the author knew that she was using EVERY trope available in this genre and that her intention was to prove that her writing skills could survive even THAT. I agree the writing was thankfully lacking overdone, dramatic messes that these tropes attract, but STILL. I honestly think the author thought she was being original. Finally, who’s surprised that Daemon is THE MOST POWERFUL OF THEM ALL? So my final words here are: read the book if you like the tropes, not because you want to break out of them. If you (secretly) liked Twilight, it’s very likely you’ll like this one too, although the reviewers I keep not-mentioning hated Twilight with the fiery heat of a thousand young suns and still fell in love with this book. I’ll tell you this though – I’m definitely going to read Onyx (if only because I’m hoping to be rewarded by a less hackneyed climax). * They have been telling me how much they hate the tropes, how much they want something new, they have been gutting even well written books just because they fall into the post-Twilight trend of vampires, werewolves and teenagers and then they dare to tell me that they love this?!! Effing Hypocrites! I liked the first one but should probably have given it something like 3.7 stars instead of full 4. This one though…this one deserves 4 stars. I said in the first book’s review there was no insta love. Evie was falling quickly for Lend in book 1, but it was still teenage crush developing into more. In this one, Evie has everything she’d always wanted. A normal life, school, a locker, surrounded everyday by normal teenagers and best of all a boy friend who loves her and who shows his true self (literally) only to her. But Evie isn’t completely happy. She feels like there has to be more to her life than school, working at a diner and waiting for the weekends for Lend to come home from College. So when she gets the chance to work for IPCA again, she takes it. Slowly and insidiously her old life makes her question the strength and importance of every new relationship she has formed over the last six months outside the Centre. I really admired how well White did this. Of course we know that Evie is risking a helluva lot (and everything that is good in her life) for what basically amounts to a desire for excitement and attention. She was special once and she wants to be again. It’s the kind of mistake you have to make to understand that it was a mistake. No matter that people you love/respect might point out every wrong at every turn, you can only ever truly learn by going down that path. Evie’s 17. She makes a 17 year old’s decisions. But what redeems her is that in the end she is aware of exactly where and how she went wrong. At no point in this story did I scream at Evie that she was making the wrong choices or making stupid assumptions. I knew she was, and she knew she was, she just suppressed that voice in her head for a while. Like we all do at some point. One final word of praise here – Lend and Evie’s relationship was sweet and steady. Of course Evie makes mistakes and Lend reacts to them, but I liked how strong their attachment to each other is. So this was an excellent sequel. On to the last one then. (But after a short break, because man oh man, I feel burnt out from all the YA books I’ve been reading). I almost rated this one three stars, but then decided it was unfair. The writing is really good, the young heroine never, EVER gets on my nerves and there is no insta love. Moreover the narrative is amusing (some people found it rolling on the ground funny, but somehow I didn’t) and both Evie and her Lend have very unusual super powers and character history. The lack of angst was also a great contributor to my enjoyment. So why nearly give it a 3 stars you may wonder (or not, you might actually have better things to do than ponder the workings of my brain) – well, I think I’m nearing a burn out. I’ve been reading too many books lately and especially in the YA/YA paranormal and UF categories. I love these genres with all the fervour of a first generation convert, but still…I need a break. I read this over six months ago and have since felt no urge to pick up the sequel. A girl in the States gets a part time job in a circus, meets a cast of peculiar characters and forms a bond with a caged tiger that she doesn’t quite understand. We can guess already that the tiger is more than an animal. Then somehow girl ends up in rural India, gets lost in a forest and ends up with only a strangely protective tiger for company. After that apparently comes some sort of a journey to break a curse that keeps our hero in the form of a tiger. And you have to admit it does sound interesting. Oh and I liked the cover. I mean, look at that pretty cover, read the awesome sounding concept (despite there existing in the market too many Hades and Persephone stories already) and then think to yourself in the first chapter that this book is different -it actually explores the mother daughter relationship that is such a huge part of the greek story. And then meet the hero. Up till then we were fine. Fine. But after that the apparently strong and self sufficient heroine turns into a whimpering damsel in distress and the gods that are supposed to be scary and intimidating turn out to have the social structure of high school seniors. Literally. I hate what this book did to my hopes for it. SO. Yuck. And that’s all.